As a previous post has discussed, your website and your online portfolio of your work are not only your base of operations, but also the place where potential clients will come find you and check your work to see if you’re worth hiring. A writer without their own website is like a vendor without his own stall. But if you’re on a budget and think you can’t afford to have your own website, here are seven affordable solutions to help you get started. WordPress is one of the most popular blogging platforms used and viewed by millions daily around the world. One of the best features of WordPress is that it’s very flexible, much so that you can turn your site into whatever you need it to be – be it a blog, an information site or a place to display your work. It also comes with hundreds of colorful themes to suit your tastes and needs. How Much? You can get started with a free WordPress site. Upgrading to premium bundles are also available and give you access to more features and support. Annual packages start at $99, or you can use WordPress through your own host like HostGator or GoDaddy. This is an easy to use site made with writers and journalists in mind. You can upload your PDF articles, links and all your related multimedia to Clippings to create a sharp-looking portfolio complete with your social links on the top of the page. You can also categorize your samples into specific categories for easier browsing. How Much? You can sign up for free, but you can get better features like your own site name and more detailed stats with the premium versions starting at $4.99 per month. This simple and easy-to-use site is often used by many journalists and writers. On Journo Portfolio you can build your portfolio through uploading or linking your articles, pictures and videos, creating multiple pages and categories for easier sorting, and using one of the many available themes to make your site look presentable. Journo Portfolio often used by many journalists and writers. Like WordPress, Journo Portfolio can also be used as a blogging platform. How Much? A Journo Portfolio domain is free and can host up to 12 articles. You can get unlimited articles with a $3.50/month plan and have your own custom domain for $8.72/month. While not a portfolio site, LinkedIn is a great place to make yourself visible professionally and potentially get hired. Search for jobs—including freelance work—through the job search feature. How Much? Signing up is free and will give you access to most of LinkedIn’s tools such as your own profile, job search and their InMail communication system. You can also choose to pay $59.99 per month for the Premium to get better features such as improved InMail and Advanced search options. Not just your average portfolio site, Contently rocks because you connect to the right clients with your written work and get more work. You can upload your work and the list of your connected publications to Contently, and they match up potential employers for you. If you’ve already gotten your name a bit out there, Contently is a great place to get your work noticed and to be matched to good employers. How Much? Free to sign up, though you’ll have to schedule a chat with one of the staff before you can be considered. Writer’s Residence’s aim is to make it easy for anyone to create a portfolio through an array of simple, fill in the textbox making tools and a good number of themes. You also get your own domain and an unlimited number of articles and other files you can post in your site. How Much? Membership costs $8.99/month, though initial sign up comes with a free 30-day trial. Squarespace has one of the most visually attractive templates around ever! If you want a site that is excellent in both content and presentation, Squarespace offers you easy to use tools and templates to get you there. While not a portfolio site exclusively, if you can afford it, Squarespace websites’ simple yet sophisticated and responsive designs are a great investment. How Much? There aren’t free options for this one. A standard version costs $8/month with other options for more expensive business and commerce packages. Having your own website is important for writers, but don’t let a short budget stop you from getting started. It’s important in the long run for you to have your own domain for better accessibility in search engines and an overall better professional appeal, but while starting out, a free yet well made and organized portfolio can still help you land the jobs that will get you there and your freelance career up and running. Great tips for those who are just starting out and don’t know where to have a home base for their business. While I do agree having your own self-hosted website is ultimately the best choice – if you want to appear professional – having a free WordPress site is the next best option. I’m sure others would agree? I would say I agree, but unfortunately a lot of free writer websites I see lack that professional appeal. I have a post going up on Be a Freelance Blogger soon about how to add credibility to your free WordPress site, and I’m really hoping it helps those people who aren’t very tech-savvy as far as web design goes. That being said, it’s probably good to be on a couple of these platforms. I would recommend being on LinkedIn as well as having your own website, for example. 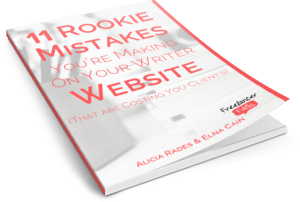 Yes I agree that having your own domain website is the best and should perhaps be the ultimate goal for all writers, especially for those planning to sell their own e-books/courses/the like in the future. But for those still starting out, either WordPress or LinkedIn are great starts. LinkedIn is an especially good place to find potential clients if you invest effort in tweaking your profile, making connections and being active in relevant forums. I’ve always believed that the measure of how much you’ve learned from a speaker is by knowing how much of what they said stuck to you. And obviously, that quote stuck to me like superglue on top Mighty Bond! 😀 Feel free to spread the knowledge! It’s all part of the joy of writing. I love the quote at the beginning, Julienne, because it makes so much sense. We want to be visible to our ideal client as a freelance writer and how can we do that without the use of a website or something like Linkedin? How can we we do that at least without social media? It is a question I haven’t thought about but was glad I answered in my own way. Thank you for the many places we can look into if we need another place for a portfolio!